Tanda can be configured to automate and apply smart settings to how you handle staff breaks. This setting is enabled by default. It allows the Time Clock to display the 'Start Break' and 'End Break' buttons. This feature can be switched off by un-ticking the permissions box, meaning the Time Clock will only show 'Clock in' and 'Clock out'. Automatic Breaks work by applying a paid or unpaid break after a particular time period worked by staff. Only one unpaid break will ever apply. All applicable paid breaks will apply. The Default rule set will apply to all staff, unless another rule set applies. This is set to deduct 30 minutes from staff as an unpaid break for shifts 5.5 hours or longer. To edit how this applies, click in the relevant field and update. 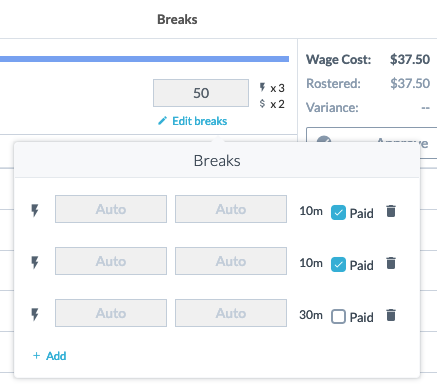 Note: If you have automatic breaks turned on and the employee clocks a break, any unpaid automatic breaks will no longer apply to the timesheet. 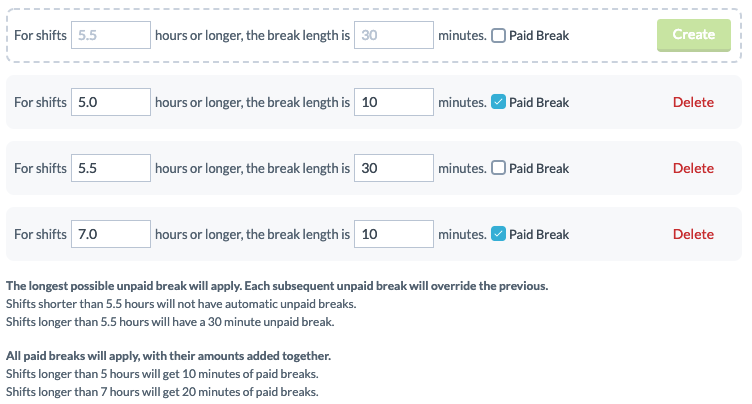 Paid automatic breaks will always apply, even if the employee has clocked a break. Click to select who you want to apply the automatic break to. This could be a particular age, or using any tag such as Casuals, Full Time or Level 2 staff. This can either relate to the Award in your account or you can create Tags to group these staff together. For these staff, the default rule set will no longer apply. 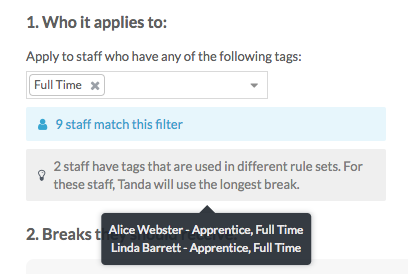 Create the tag here in your account in Tanda and then apply to staff by checking out the Bulk Categorise Staff article. You can also create multiple rules under the one rule set, when different break lengths apply to different shift lengths. It's important to remember that only one unpaid break will apply, but that all relevant paid breaks will apply. When two or more custom rule sets all apply to a given employee, you will see a notice similar to the one below. All of the rules under each rule set will apply. If the rule sets have any conflicting rules for a given shift length, the longest break length will be applied. A custom rule will override the default rule for the employees it applies to. e.g. If the default rule set specifies a break after 5.5 hours, and a Custom Rule specifies Full Time workers will get a break after 7 hours, full timer workers will not receive an automatic break until they have worked for 7 hours. In other words, if one or more custom rules set apply to a given employee, the default rule set is ignored. You can use this to effectively disable automatic breaks for certain employees. e.g. You could create an empty rule set for chefs such that all employees would receive automatic breaks as per the default rule set, except chefs, would not receive one at all.